A law was passed on 3-Feb-1853 that allowed a widow of almost any veteran to receive a pension, even if she married the veteran long after his service. I found this information on a very helpful site “Pensions Enacted by Congress for American Revolutionary War Veterans” that describes all the different laws passed by Congress over the years concerning pensions for Revolutionary War Service. It has been very useful to me in understanding who was eligible, why they became eligible, and when they first became eligible. The first document is the Widow’s Application for pension followed by some affidavits from neighbors who knew the couple and could attest to their marriage and his death. 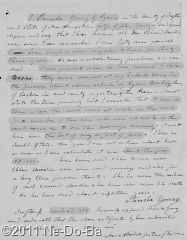 I will not be transcribing these documents but my readers can click on the images to read them. Descendants should also note there are additional affidavits in the pension record they may of interest to them but do not add any new data to our investigation. Here are the documents and my thoughts on them will follow. Edward’s widow, Chloe (Barnes) Marden, filed for her pension in court on 15-Mar-1853, just weeks after the latest pension law was enacted. According to the law she does not have to prove need, only that she is the widow of a Revolutionary War soldier. She states her prior name, age, residence, when she married Edward, and when Edward died. She then supplies affidavits from neighbors to support her claim. What a wonderful surprise to find some details about the actual marriage ceremony! The marriage was performed by Cyrus Burkley, a local Justice of the Peace who did not take the time to register the marriage with the town clerk. The ceremony took place about 11 o’clock in the morning at the home of John & Pamela Young in late May or early June. Pamela states she has known “Old Mr. Edward Marden” ever since she can remember and has been “a near neighbor” for 33 years. No one seems to remember the exact date of the marriage but they are certain of the approximate time of year. It was when the men were working on the road, referring to community road improvements which would occur after mud season and before summer planting. They remember this because the men stopped their work and attended the ceremony. How often do we find such wonderful little details for a marriage ceremony that took place in the 1830s? I think its pretty cool! 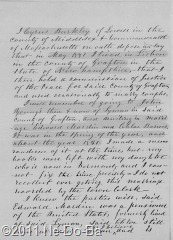 In 1853, Phineas Ash of Lisbon, NH says he used to live in Lyman and became acquainted with Edward Marden about 40 years ago (c1813). He goes on to state Edward died at his house in Lyman 16-Mar-1835. He also says Chloe was by Edward’s side at the time of his death. One of the most wonderful things about pension files is they usually provide exact dates of death for soldiers. In addition, they often provide affidavits concerning the death which give me little bits of additional information. Since deaths are not always recorded by town clerks or ministers, pension records frequently provide the only source of death information available to researchers of early time periods. As is so common with research, this affidavit of death also raises a few questions. Why was Edward at the home of Phineas Ash when he died? Was he injured or collapsed and carried to the nearest home? When his wife of 1820 died, was he required to vacate her property? Were they living in the home of Phineas Ash? Was Phineas related to Edward or any of his wife in any way? All questions I may never find answers for, but it is always fun trying. What do these documents tell me? In March of 1853, Edward’s widow is alive, living in Lyman, and has not remarried. Her “prior” name was Barnes, but she doesn’t state if she had a prior marriage or any living children. This could be her maiden name or her name from a prior marriage. 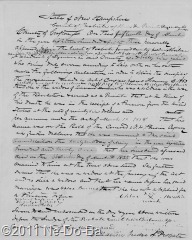 I now have historical documentation (sworn affidavits) of a marriage for Edward to Chloe Barnes in late May or early June of 1831. This is very important, since the marriage is not recorded in public records. 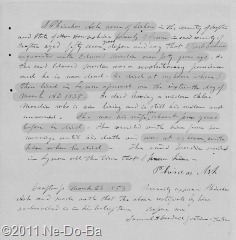 I now have historical documentation (sworn affidavits) that Edward Marden died 16-Mar-1835 in Lyman, NH. This is also important since the death is not recorded in public records. After reading these documents I am left wondering many things. What was it about Edward that attracted women young enough to be his daughter? They certainly were not attracted to his wealth, for he had none as early as 1820. When the wife of 1820 died (and at this point I must assumed she died since I know she was unhealthy and divorce was rare at that time) he probably lost the use of her land and the cabin on it. I know he would have lost the land because he said so in his inventory list. He stated he had no title to the land only the right to occupy it as long as his wife was alive. When he married Chloe in 1831 he should have been destitute. His pension certainly was not going to support two any better than one and it would disappear as soon as he died. What would stir Chloe to marry a man that couldn’t support her and would leave her with nothing when he died? How did Chloe (Barnes) Marden support herself from the time of Edward’s death in 1835 until the time she finally received a pension in the late 1850s? Why didn’t she remarry? Now that I am certain of a name for his wife, I think I should put her on my to-do list. What more can I learn about Chloe Barnes? What do my readers think about Edward and his young wives? Anyone care to make a comment or speculate?